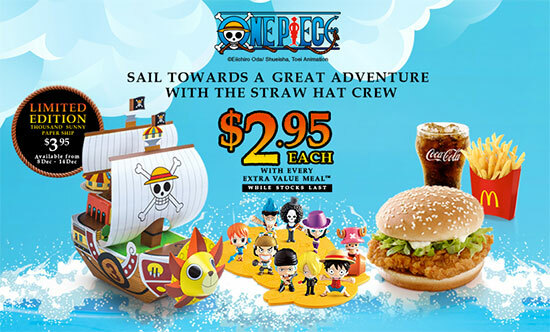 Without we knowing, Singapore McDonalds had surprise us with the popular anime One Piece collectiables for their Happy Extra value Meal purchases. This should be the first time we see a Japanese Anime figures beside pokemon for McDonalds Singapore. The Nine figurines will be on sale island-wide starting today 17 November 2014 to 8 December 2014 with the purchase of an Extra Value Meal with additional S$2.95 each. Note only one toy per EXTRA value meal. For the “Thousand.Sunny” paper model ship is SGD$3.95 would be only limited to 100 of them in each outlet. So if you really want to get that, you have to be fast. McDonald’s will be also organizing an Instagram contest from now till 21 November 2014 for top One Piece fans. 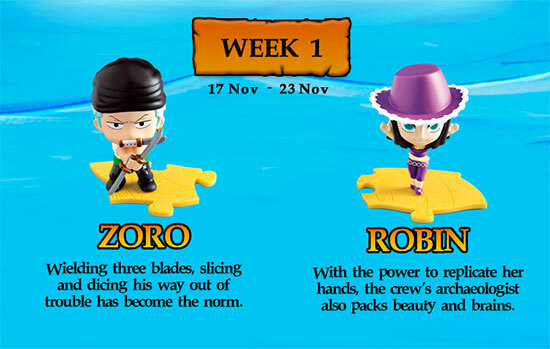 You just need to post Instagram and hashtag #McDSGOnePiece with another One Piece related (toys, cosplay together with the first week figuries Zoro and Robin). The top 30 creative images will be invited to an exclusive One Piece Fan Appreciation Party on 28 November. 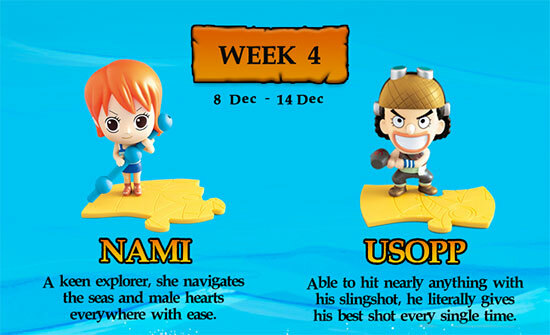 The top two knowledgable one piece fans will win a 3 day passes to the Anime Festival Asia Singapore in December. 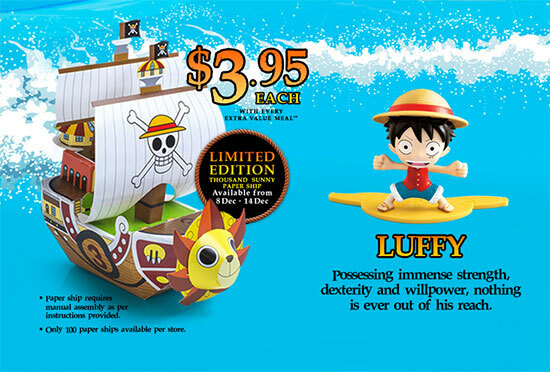 One Piece fans, start collecting now!! 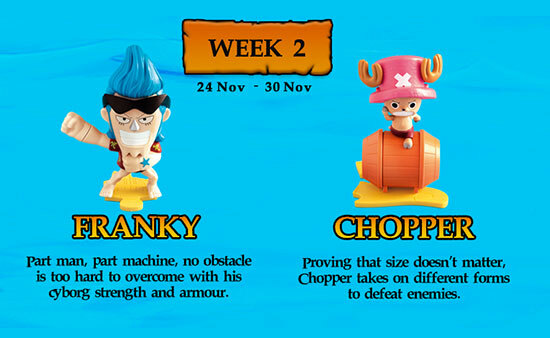 is there anyway that I can buy Franky? Is there any place for thousand sunny? I want zoro, anyone want to exchange zoro? Anyone want ship? Exchange zoro..
Hi , anyone has extra franky, willing to trade with sanji or $5. Contact me ,thx. 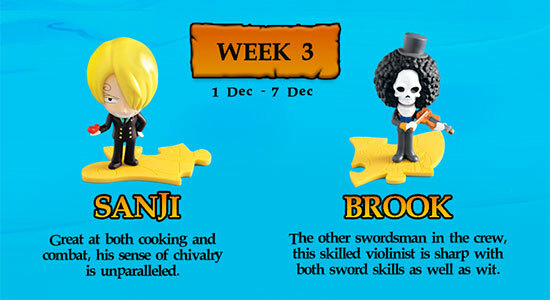 Want to buy Sanji and Franky, contact me at 84613446.